“No Woman, No Cry!” This goes for men too! Cry no more! 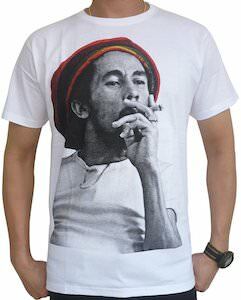 The most legendary Bob Marley t-shirt is now available for you! This iconic image of Marley shows him taking a big tug off of a huge blunt, this is part of the norm for Rastafarians and respectfully, part and parcel of the culture and spirituality of this reggae Giant! What is cool about this picture of Bob is that it is largely black and white, however, the very colourful Rasta hat he is wearing, his dyed hemp knit toque, is bright and bold in it’s “Red, Orange and Green” Rasta coloration! What a cool effect to draw the eyes towards this awesome homage to this larger than life hero. “Bob Marley poet and a prophet! Bob Marley taught me how to off it! Who can deny the quintessential cool of this man and what he embodies! About the quality of the shirt itself, rest assured that it is top notch, 100% cotton, breathable, and eco friendly as you would expect! It would go great with your existing wardrobe, just as easily worn under a sports jacket, or with any combination you could imagine. This handmade printed t-shirt is made in Thailand. Get your respect on, for one of the best artists that ever walked God’s green earth! Choose the size of this lovely shirt that best fits you, from Small – Large! Makes a great gift for yourself or a like minded lover of Reggae!